Designers choose paver styles to harmonize with the surrounding area. Two colors of pavers can be combined to provide interest in large areas. Pavers also come in blended colors to add interest. Pavers are similar to other colored concrete, or brick products: shade variations may occur. This can result from slight variations in dye lots and the raw materials used. Install pavers from several pallets at a time. Pavers can be selected to complement the stone or facade on the building. 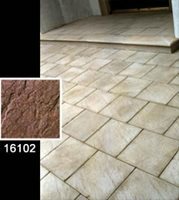 Oftentimes, pavers one or two shades lighter than the structure are selected so as not to compete for attention with the structure. The use of brick pavers with wood or stone houses adds warmth. Pavers can have different textures. When different textures are combined it adds interest. Avoid long straight rows of pavers. If straight runs are required, lay the edge pavers parallel to the edge of the path and use a basket weave pattern in the interior. For Victorian style houses, repeat the curves of the arched windows and doors by designing curved edges. For rectangular colonial styles, repeat the shape by using brick-shaped pavers. For brick homes, select pavers lighter than the brick used on the home or use cobblestone.